After 150 years, Lourdes France, still holds a special place in the hearts and minds of millions around the world. 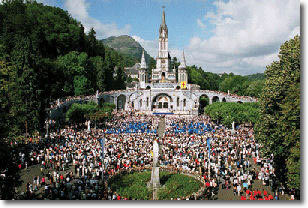 Dubbed a “place of miracles,” Lourdes is where the Blessed Virgin Mary appeared 18 times beginning February 11, 1858. Our Lady’s message of Lourdes took root and flourished against staggering odds, and continues to yield tremendous graces in the lives of countless people today. The first obstacle to the apparitions at Lourdes could well have been the story’s protagonist: Bernadette Soubirous, a poor and sickly and uneducated fourteen-year-old girl. But Bernadette’s purity of heart enabled her to receive unconditionally what was revealed to her. Her steadfast faith made her determined to remain true to the special mission entrusted to her, despite the ridicule and cruelty of unbelievers and hostile reactions from police and clergy. As word of the apparitions spread, crowds began to mob the small Lourdes grotto. Though few words were spoken, the messages were rich in meaning. Bernadette accepted without hesitation the beautiful lady’s invitation to come to the grotto for fifteen days, although she knew neither the name of her mysterious new friend nor the purpose of these visits. She was told she would not find happiness in this world, but in the “other” – a prophetic reference to the difficult but rewarding path to sanctity that lie ahead. In time, the apparitions took on a somber tone as the lady lamented over the sins of God’s people. Witnesses saw the great sorrow in Bernadette’s face as she gazed up at the niche in the grotto where the lady appeared. “Penance! Penance! Penance! Pray to God for the conversion of sinners,” the lady pleaded. And Bernadette firmly resolved to make this her life’s mission. At the lady’s instruction, Bernadette crawled about on the filthy grotto floor and kissed it in penance for sinners. She ate wild cress growing on the cave walls and scratched at the dirt until she found some muddy water with which to wash her face and drink. This muddy water would bubble forth into a clear mountain spring that brought immediate and astounding cures to many, attracting attention throughout France and beyond. When the lady in the grotto expressed her desire for a chapel and for people to come in procession, Bernadette delivered the message to her parish priest. His reception was less than friendly. France was being torn by revolutions in politics, industry, and secularism, and the Church that once held a place of honor and respect was desperately trying to regain its footing in a rapidly changing and dangerous environment. Most of the clergy were opposed to what they deemed a superstitious claim of the supernatural, and Bernadette’s parish priest was no exception. It was not until the lady said to Bernadette, “I am the Immaculate Conception,” that the priest believed her. After all, how could an illiterate peasant who barely understood her catechism know such an advanced term, when the Church had only professed the dogma of the Immaculate Conception four years earlier? It took another four years of intense investigation for the bishop of Tarbes and Lourdes to approve the apparitions as worthy of belief. The grotto and its miraculous spring were then made available to the public. Church approval, however, did not keep the events at Lourdes from being attacked in the press. Columnists mocked the apparitions and their followers, particularly the vast numbers of pilgrims with illness and disabilities who looked upon Lourdes as their last vestige of hope. The journey for the pilgrims was often long and arduous, and many died before ever setting eyes on the place of miracles. Others perished on the trip home. Medical professionals tried to close the sanctuary on the grounds of unsanitary conditions. Yet despite the protests from the secular and medical world, belief in the apparitions could not be squelched. The grotto there offered people a truth about life—and death—that the world could not. What is it about Bernadette’s story that annually beckons upwards of six million people from around the world? As Lourdes Bishop Jacques Perrier is quick to point out, Lourdes is not a historical museum, commemorating something that happened 150 years ago. It is a living sanctuary that proclaims the Gospel message of prayer, penance, love, and service to one another. It is a powerful witness to hope and healing for those who suffer physically, emotionally, and spiritually. And while miraculous cures have been documented as a result of prayer to the Virgin or contact with the water, a far deeper healing of mind and heart is the true miracle of Lourdes. This is manifested daily in the peaceful acceptance of one’s illness or disability, the realization of the fullness of the love of the Lord, and the resolve to embrace life with renewed strength. Lourdes is first and foremost a place of prayer. Bernadette set this example by praying the rosary with the lady at the start of each visit. To a world focused on achieving happiness through power, prestige, and other empty promises, Lourdes delivers a strikingly different message. It rises above the temptation to wallow in negativity and despair by offering hope—hope for miracles; healings; a new life or even a peaceful death. Lourdes teaches by example that God always prevails despite impossible odds. Visitors are challenged to surrender their stubborn wills and make the changes needed to live holier lives. Lourdes also calls us to turn our gaze outward, to pray for the sins of others, and to demonstrate love for one another through acts of service and charity. Lastly, we may consider the appearance of the Immaculate Virgin in a less-than-immaculate grotto to a child of lowly status and compromised health. In this unique encounter, Christ speaks to us through his mother and meets us where we are in life, in the midst of our poverty and our failures. He comes to tell us that he loves us just as we are, with our successes but also with our wounds, our weaknesses, and our limitations. Empowered by this love, we are asked to in turn to love and serve our fellow humankind in their physical and spiritual poverty. This sense of conversion and renewal that is received so abundantly through devotion to Lourdes still gives us reason to celebrate 150 years later.